Greg Lewis began his tenure as Executive Director on April 1, 2005. In that position he has oversight responsibility for all Washington Revels operations and is a (non-voting) member of the Board of Directors. Greg is well known to Christmas Revels audiences from his roles as soloist in “Lord of the Dance” and leader of the audience sing-a-longs. Starting with the first Christmas Revels in Washington in 1983, Greg has performed in all but 5 Christmas shows and in all but 3 May Revels celebrations, and has regularly performed with the Washington Revels Maritime Voices and Washington Revels Heritage Voices since the inception of those ensembles. Prior to becoming Executive Director he was a member of the Board of Directors for 5 years, serving as Vice Chair and Chair of the Governance Committee. Professionally, Greg was an associate and then partner at a large, international law firm from 1978-1994, returning to the firm again as a partner from 1999-2004. From 1994 to 1999 he helped found and then headed a small U.S. airline that flew between Washington, D.C. and South Africa, and was involved in several other aviation-related projects. He has performed with and served on the boards of several other organizations in addition to Washington Revels. 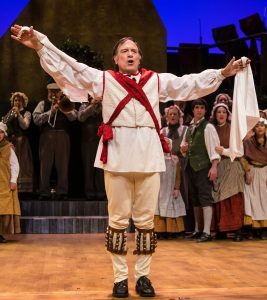 Greg’s wife, Susan, has held the title of Company Manager for Washington Revels since 1991, and has performed in over 25 Christmas Revels productions. Revels is a family affair for Greg and Susan: their three sons, Chris, Marc and Trevor, have all performed in numerous Christmas Revels and other productions; and their grandson, Kieran, at age 4, started the ball rolling for the family’s next generation of Revelers with his participation in the “Little Dragons” after-school workshop.